Hola a tod@s. Hoy me estreno en mi blog y estoy algo más que nerviosa, ya que es mi primer post. Quisiera haber publicado mi primer post el 14 de febrero, pero por varios motivos no me fue posible, pero como se dice en mi tierra más vale tarde que nunca, así que aquí lo tienen. Hello everybody! Today I start my blogg. I am pretty nervous because this is my first post. Originally I intended to start it on February 14, but this was not possible. But as we say in my country better late than never, so here is my 1st post. Estuvé tentada a publicar alguna de las recetas que iré incluyendo más adelante, pero decidí que en primer lugar, debería presentarles el lugar donde vivo y desde donde les escribo. I was thinking about publishing one or more of my recipies, but I think it was better that I give you first some information about where I live. Esto es Neu-Anspach en Alemania. Es un pueblo en las afueras de Fráncfort del Meno. Neu-Anspach se encuentra situado en la montaña del Taunus a tan solo 10 minutos de Bad Homburg. 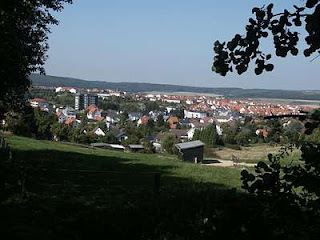 Neu-Anspach is a town in the Hochtaunuskreis in Hesse, Germany. Neu-Anspach borders in the north on the town of Usingen, in the east on the community of Wehrheim, in the south on the town of Bad Homburg and in the west on the community of Schmitten. La ubicación de Neu-Anspach es idílica, es un lugar tranquilo y está rodeado por un bosque de abetos y árboles frondosos. Este bosque existe desde hace millones de años y este mismo bosque fue la frontera entre el pueblo Germano y el Imperio Romano, todo ésto aprox. en el año 30 a.d. Cristo! Nosotros vivimos a tan solo 10 minutos a pie del bosque, lo que nos da oportunidad, sí queremos y sobre todo sí hay tiempo, de hacer senderismo todos los días. La primera vez que unos amigos nos visitaron aquí, nos han dicho lo afortunados que somos de vivir donde los demás hacen vacaciones. A unos cuantos kilómetros de Neu-Anspach se encuentra situado uno de los museos más maravillosos y único en el mundo. Se trata del museo Saalburg, que es un antiguo castillo Romano, el cual gracias a la inciativa del Emperador Willhelm II fue reconstruído entre 1897 y 1907, además se encuentra bajo la protección de la UNESCO como patrimonio de la humanidad. Join us for a trip into Roman times. 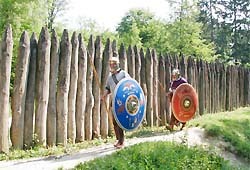 Discover the past where history was made: at the world’s only reconstructed Roman fort and archaeological museum – just next to the Limes World Heritage site, the ancient frontier between the Roman Empire and the Germanic tribal territories. In Roman times, the Saalburg fort kept watch over a section of the Limes in the Taunus hills. From the end of the 1st century AD, for approximately the next 160 years, the Limes marked the frontier between Rome’s Empire and the Germanic tribal territories. The fort’s garrison was made up of 500 to 600 soldiers – both infantry and cavalry. A bath house and guest house were located just outside the main gate. A village housing craftsmen, traders and tavern keepers adjoined the fort. The Roman road to Nida (today, Frankfurt-Heddernheim) was lined with graves and small shrines. It is likely that as many as 2,000 people lived here at one time. The fort and village fell into disrepair when, due to increasingly strong Germanic incursions, the Limes was abandoned around AD 260. Today, the remains of the 550 km long frontier complex, which extend from the Rhine to the River Danube, comprise Europe’s largest ancient monument. After initial archaeological investigation in the mid-19th century, thanks to an initiative led by Emperor Wilhelm II, the fort was rebuild between 1897 and 1907 to serve as open-air museum and research institute. 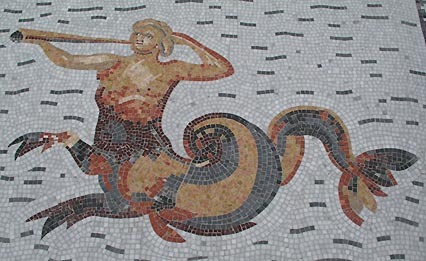 In 2003, with the reconstruction of additional buildings, the first steps were taken toward the creation of an archaeological Park. 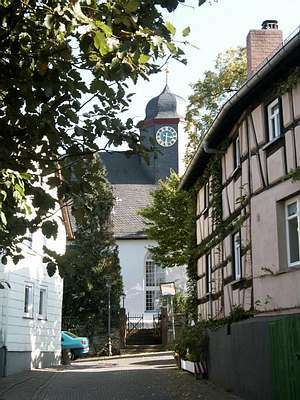 In July 2005, the Limes (an with it, the Saalburg) joined the list of UNESCO World Heritage Sites. Otro de los museos que tenemos aquí es el Hessenpark, éste es un museo al aire libre compuesto por más de 100 casas históricas, en el cual se hace una reseña de los oficios, las artesanías, la cultura y la agricultura de cuatro siglos. An exciting survey awaits you here of more than 400 years of rural life in Hesse –from houses complete with original items of furniture, permanent exhibitions, for example, of church steeple clocks, a historical post office or Hessian painting, to presentations of old craft and farming techniques, to a variety of events and recitals all of which are listed in this calendar. You will get a vivid impression of how people lived and worked in the past over an area of 150 acres and in more than 100 original buildings. Si vienen a Alemania, no dejen de visitar estos museos y vivan la experiencia de hacer un viaje por un pasado lleno de historia y cultura. If you come to Germany take the opportunity to visit both museums and make a trip to the past full of history and culture. Hasta pronto / See you soon.